Rep. Jim Jordan explains to a crowd of Allen County Republicans the dangers of an open border. 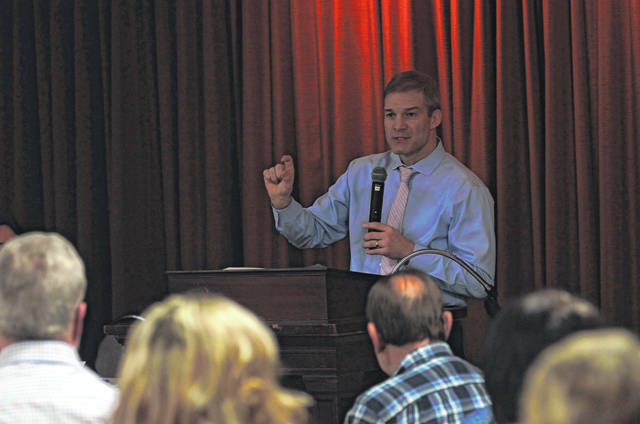 LIMA — While much has changed in Washington, D.C., in the last three months — a drastic reshuffling of political power in the House of Representatives and the longest federal shutdown in American history — not much has changed for Rep. Jim Jordan, who visited Allen County Republicans for the first time since election season this Friday afternoon. “Back during the campaign, I said this many times: ‘The left has gone crazy.’ And I’m here to tell you today that they haven’t changed. They’re still crazy,” Jordan said, using examples from the actions of Colin Kaepernick, New York Gov. Andrew Cuomo and Rep. Maxine Waters to make his point. “The left believes we’re just one of 190-some countries on the planet. But most Americans don’t start from that premise. They say: ‘No no no no no. We’re THE country, the greatest country. We’re not just one of the 190, just some other nation. We’re the United States of America, the greatest nation in history,” Jordan said. As for the border wall, Jordan said Trump will most likely avoid another government shutdown for the wall by declaring an emergency at the border to do so. That attempt will most likely end up taking a lengthy amount of time and lead to further fights over the constitutional right to do so.